I am by nature a landsman. So it took me a while to get it. But after a strange decade in which story assignments placed me on more rivers than the tribespeople of Survivor, I now know the signature moment of a river trip. It’s when you get very wet, very unexpectedly, and realize your day is not ruined. Here, for the full range of crafts and experience levels, are the best places in the Northeast to get it. This five-day, inn-to-inn trip, run by BattenKill Canoe, takes you to a handful of mellow, ridiculously scenic rivers. The classic White, banked by lovely farmland and full of clear swimming holes, usually caps off the outing. At night, you’ll stay at historic country inns, such as the hillside Green Trails Inn, a seven-acre estate south of Montpelier that features an eighteenth-century guest house with original wall stenciling. The breakfast room (think stuffed French toast with real Vermont maple syrup) overlooks Sunset Lake and the landmark Floating Bridge (prices start at $1,175; call 800-421-5268). 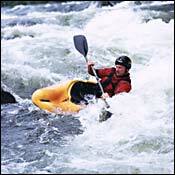 The Deerfield’s fun but forgiving rapids and consistent summerlong flows make it a perfect place for the beginning kayaker. Zoar Outdoor, run by former world-champion paddler Bruce Lessels, provides boats, experienced instructors, and hand-holding (call 800-532-7483; prices start at $235 per person for the two-day novice camp). The turn-of-the-past-century Brandt House Inn, in nearby Greenfield, offers king-size feather beds, sunny, richly furnished rooms—with garden-picked flowers daily—and a mighty view into the Berkshires (doubles start at $140; call 413-774-3329). Kennebec River, the Forks, Maine This guided all-day trip is front-loaded with an intense, big-rapid descent through a rock-walled gorge. You’re in a self-bailing raft with a half-dozen others, each of you armed with life jackets and paddles. No experience is necessary (the guides are excellent, and the rapids aren’t especially technical), but you should be someone who likes, say, a roller coaster. Northern Outdoors offers daily trips and the New England equivalent of a dude ranch—a handsome timber lodge, with well-appointed cabins and a fine micro-brewery on the premises—near the takeout (prices start at $102 per person; call 800-765-raft). It’s not exactly The Real Cancun, but expect fun-loving crowds on the north country’s premier party river. Tubers, canoeists, and the occasional person on an inflatable Orca float the gin-clear flows between Center Conway and Hiram, Maine, overnighting either on white-sand beaches or in nearby North Conway. Contact Saco Bound in Center Conway for rentals and shuttle information (603-447-2177; prices start at $25 for canoe rentals, $11 for shuttles). The 1787 Nereledge Inn bed-and-breakfast in North Conway is cozy and handsomely furnished (doubles start at $69; call 603-356-2831).